Another MacNeil piece just steps away in the adjoining American Gallery provides a “preface” to the story of “The Sun Vow”. Several pieces dated 1894 seemed to be early prototypes for later larger works and castings. 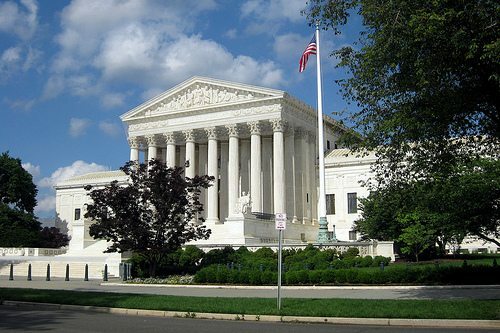 The “Vow of Vengeance” appears to be one of the more prominent. I know of no other copies elsewhere. Well, somehow I noticed a discrepancy in the name.. 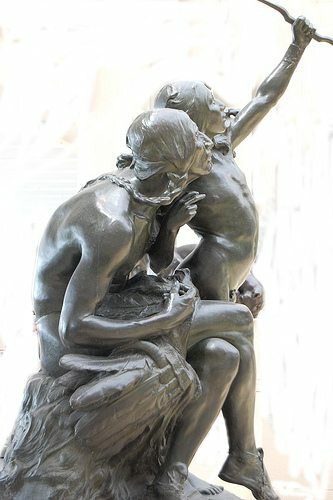 But marker at the Art Institute has the name – The Sun Vow [Modeled-1898, Cast-1901]. http://theartinstituteofchicago.blogspot.com/2010_12_01_archive.html. TITLE: The two titles carry contrasting emotional messages. The first (Vow of Vengeance) conveys negative aggression and hostile feeling toward some enemy, while the second (Sun Vow) depicts a more positive rite of passage from boyhood to manhood within a setting of family and tribal affirmation. 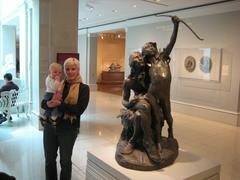 GROUPING: The boy and the Elder (Warrior, Chief) are grouped to convey different emotional tones in the two pieces. In “Vengeance,” the chief wears his war bonnet on his head. He is dressed to present tribal authority to the enemy. His face seems harsh and his posture stiff. The Boy strains his head high up into the air. Their grouping seems tense. 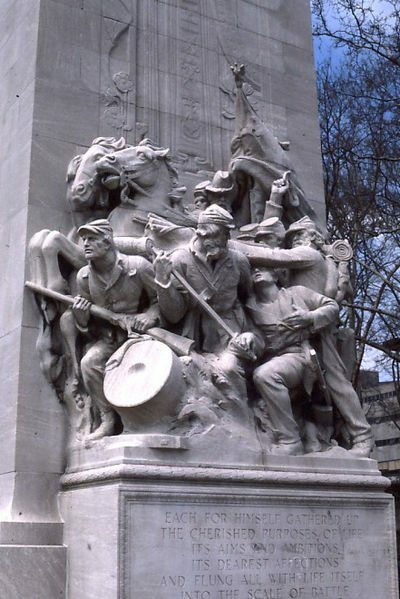 In “Sun Vow” the two figures are closer and seem to be “more one.” The Chief has removed his bonnet so as to lean into the boy’s line of sight. The boy is also more grace-full. He looks to the arrow and the sun without straining. Both gaze in the seeming wonder and mystical pleasure of the physical rite. In addition to the “Vow of Vengeance” we have found evidence of another prototype from 1894. The period after the end of the 1893 Chicago World’s Fair was a lean, even dry time, financially for Hermon MacNeil. We do know that he continued to maintain a studio, sculpt models, teach at the Art Institute of Chicago, and associate with art colleagues and benefactors there. Yet, it seems a productive time of transition, expression, and experimentation for the as the young sculptor. 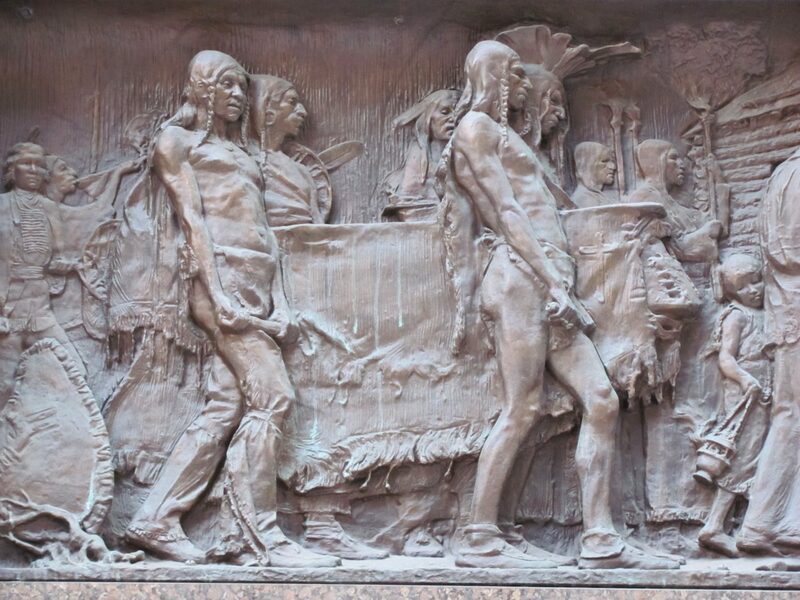 Traveling to the Art Museum, we walked out of the underground on Dearborn Street just a block south of the Marquette Building which is home to Hermon MacNeil’s 1895 sculptures of 4 bronze relief panels [Cick Here]. This commission marked his recognition and selection for the award of the Rinehart Roman Scholarship. This began 3 years in Rome and another in Paris for he and his young bride, Carol Brooks. 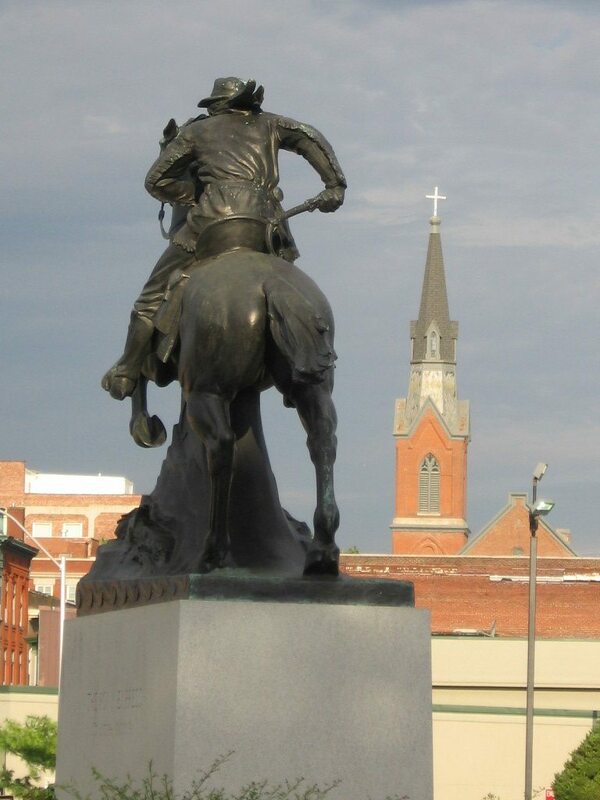 The bronze reliefs stands today as an icon to Marquette and his life among the Native peoples. The building has been restored by the MacArthur Foundation and now houses their international headquarters. 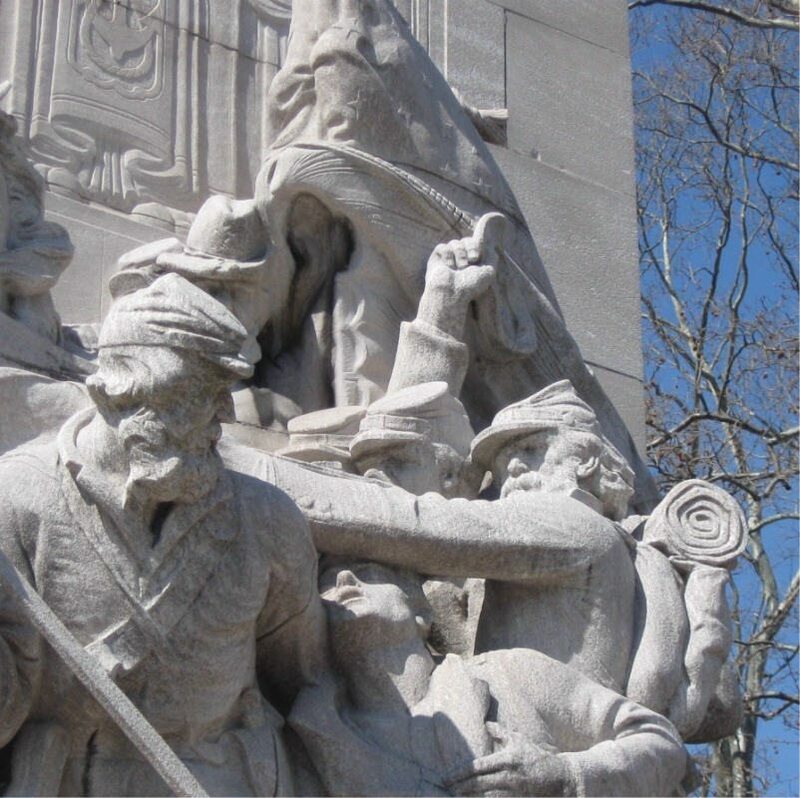 Those works tell the story Father Marquette explorations to Native peoples of Illinois. 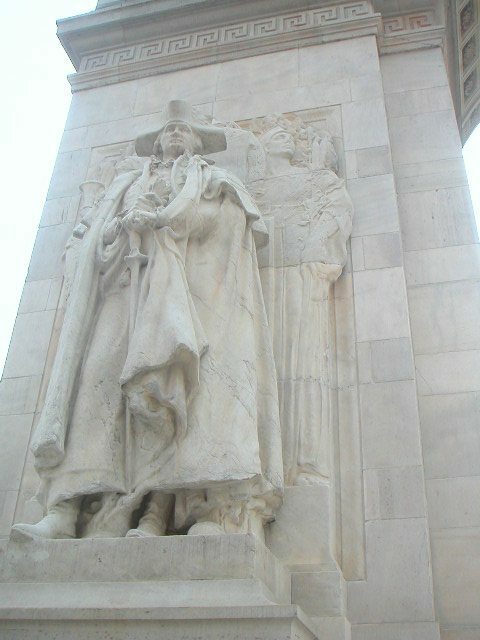 MacNeil would return to Chicago and the Marquette themes three decades later as he sculpted the bronze grouping [CLICK HERE] of Pere Marquette, Louis Jolliete, and an Illinois Indian on Marshall Boulevard. 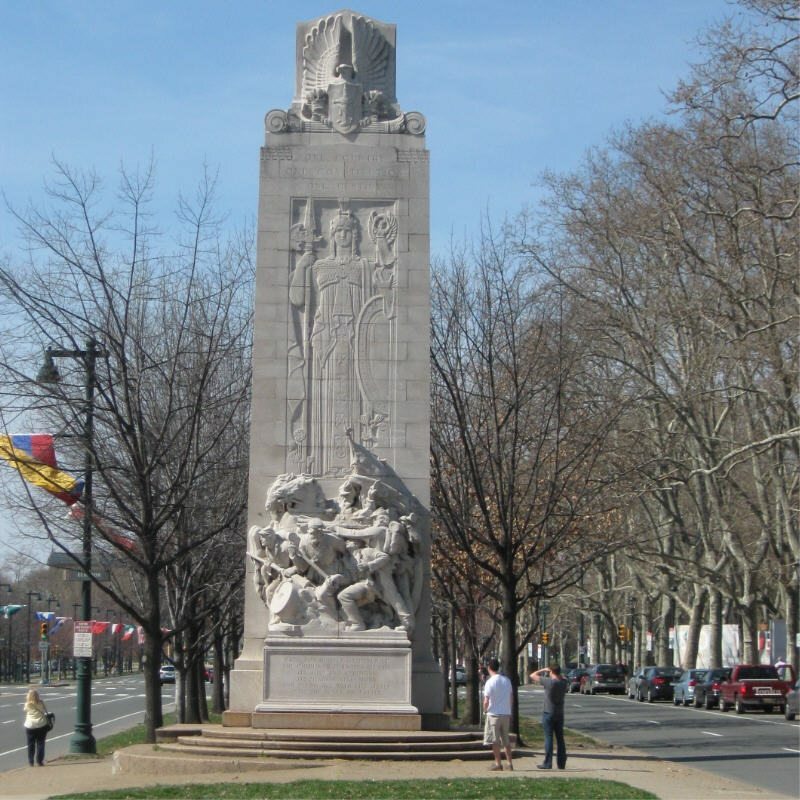 Commissioned by the Benjamin Franklin Ferguson Monument Fund, this sculpture has faced the greenway of the boulevard for 88 years. Our trip was a satisfying success as our daughter took our pictures at hefoot of the Monument. 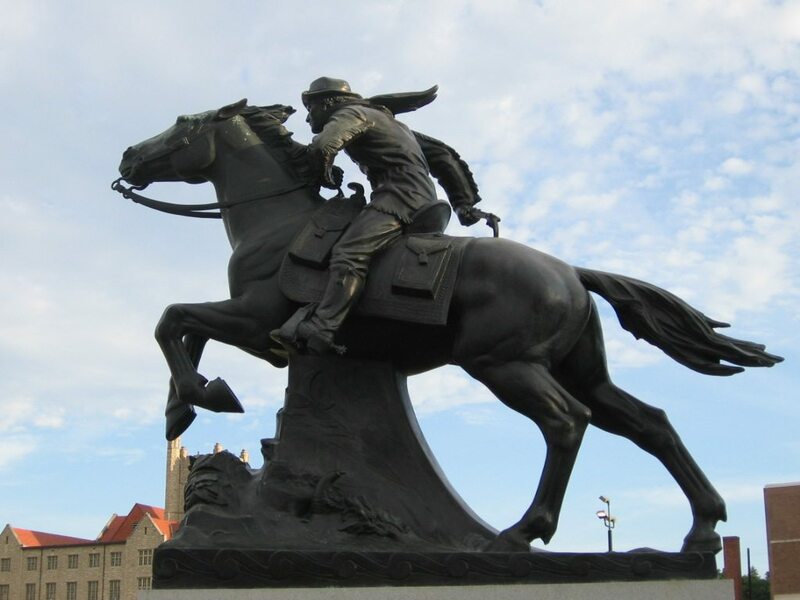 Following-up the previous post of April 23, 2013, I offer this fascinating link to a great lecture on the colorful legend of the Pony Express. 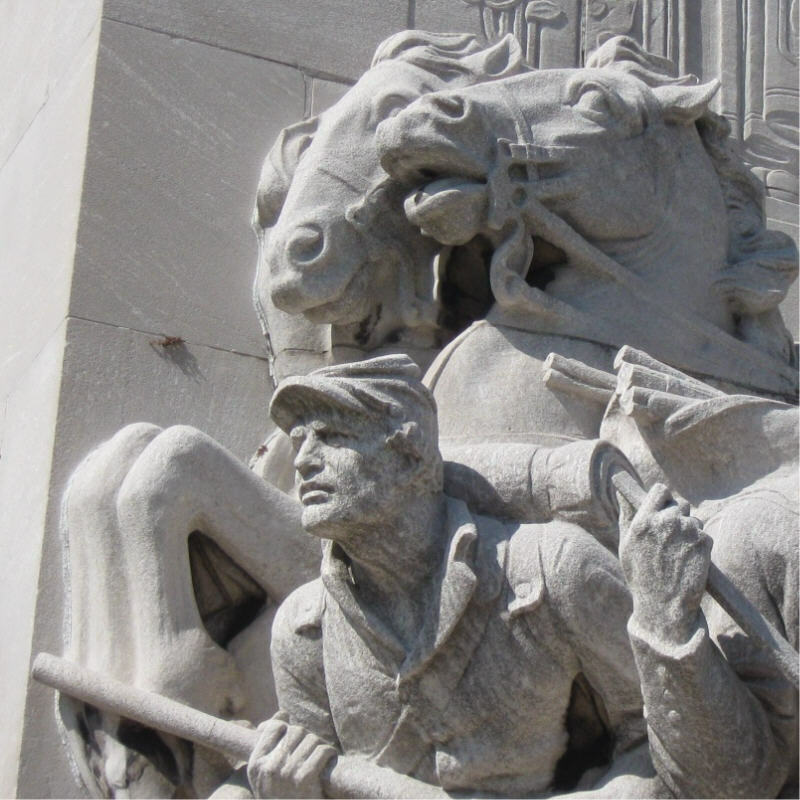 Author Christopher Corbett [ CLICK HERE ] spoke about his book “Orphans Preferred: The Twisted Truth and Lasting Legend of the Pony Express” His 54 minute YouTube video shares humorous stories of Buffalo Bill, Pony Express, and research findings. The presentation includes questions from the audience, as well. 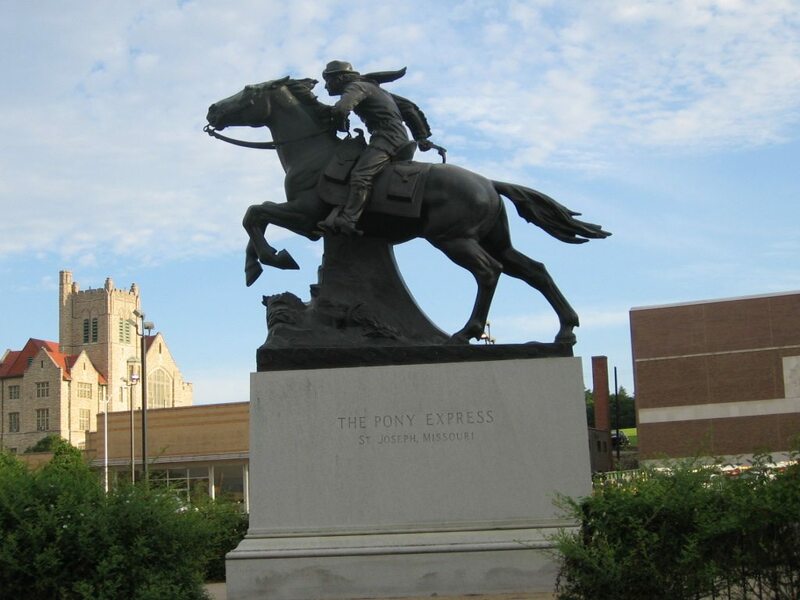 The Pony Express at St Joseph, Missouri. Dan Leininger, webmaster, has visited it many times as a small boy. 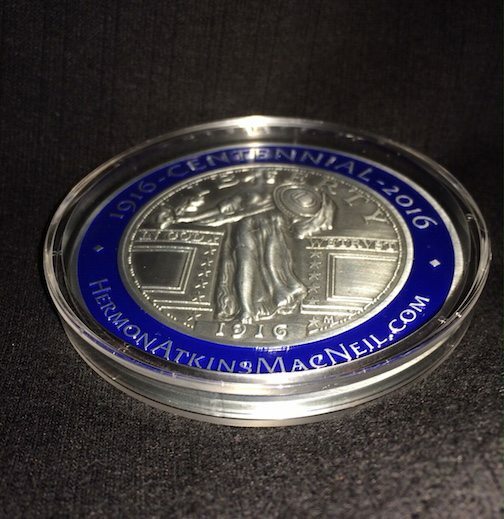 Now it is part of his ongoing research on Hermon MacNeil. 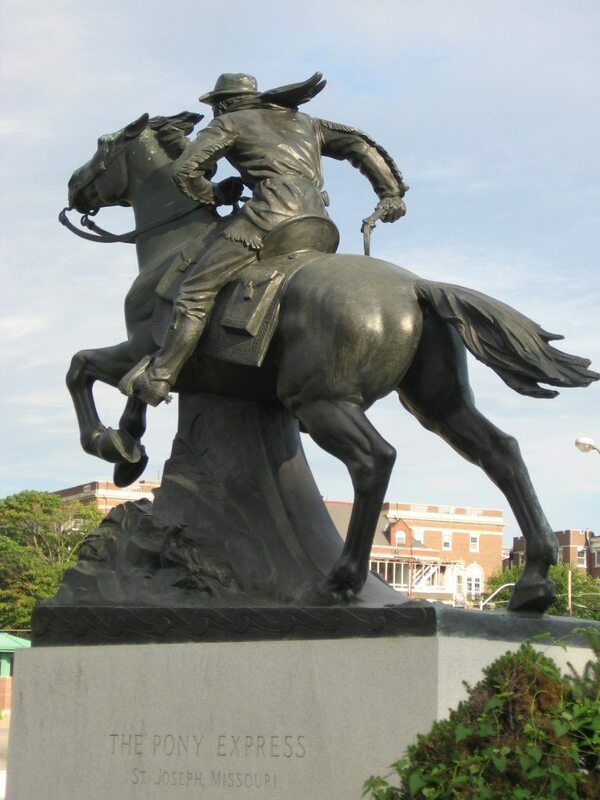 Hermon MacNeil’s last sculpture was the Pony Express Rider erected in 1940 in Saint Joseph, Missouri. 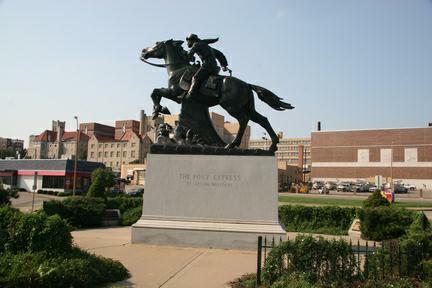 A skit of the Pony Express was a feature of every show given by Buffalo Bill Cody. 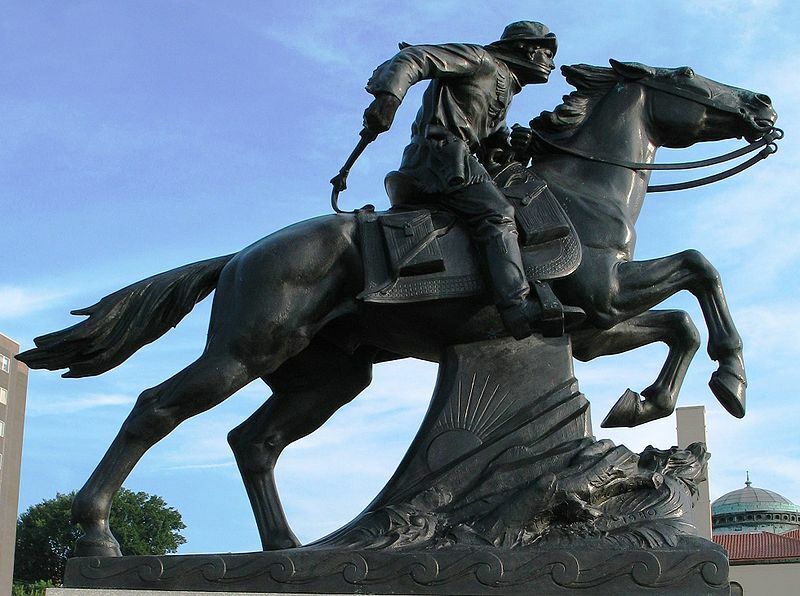 We can thank Buffalo Bill for infecting American History with the Pony Express legend. He even infected world history with images of the Pony Express. 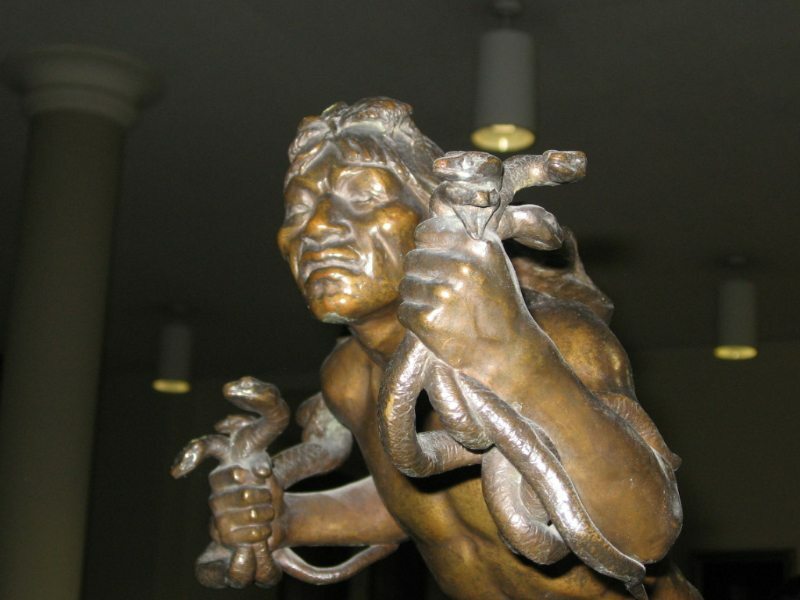 Hermon MacNeil became captivated by the images of the Native American Indians (Black Pipe and others) in head. He was first introduced to those visions in Buffalo Bill’s Wild West Show outside of the front gates of the 1893 Chicago World’s Fair. 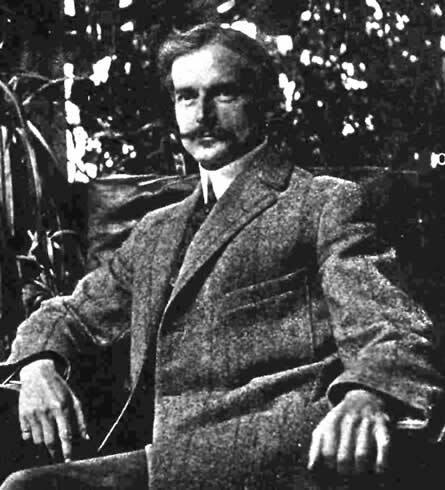 After this MacNeil traveled to the Southwestern United States. That experience affected him profoundly. 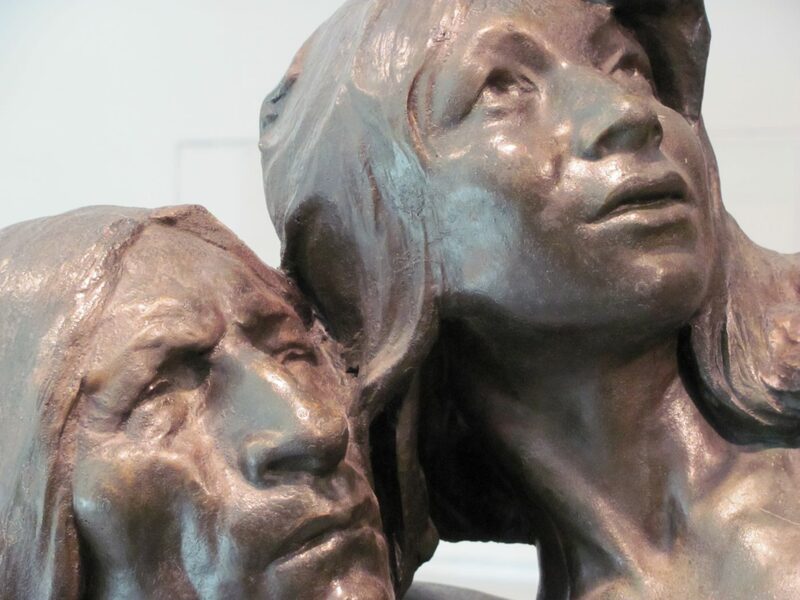 From then on, he produced sculptures and returned to those images of Native Americans and Indian themes throughout his life. In 1890 Buffalo Bill rode his troop around Vatican City for the Pope. I never rode with the Pony Express, and neither did Buffalo Bill, though he was the right age to do it in 1860 (He did ride as a courier as a very young boy). However, I almost got a Pony Express ornament for my 1939 LaSalle in 2012 (see below). 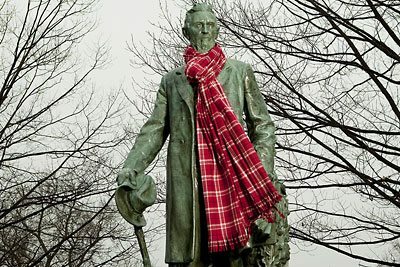 The statue is MacNeil’s. The LaSalle is mine. (The trailer belongs to Chris Carlsen.) The location is Saint Joseph, Missouri. Enough foolishness, already. Below are more Pony Express images from St. Joe. Details of the mail bags as MacNeil modeled them after Dr. S. Mededith Strong’s authentic Pony express gear, spurs, saddle, mail bags, from the 1930’s. Eda Lord's Chicago World's Fair Ticket from 'Chicago Day.' 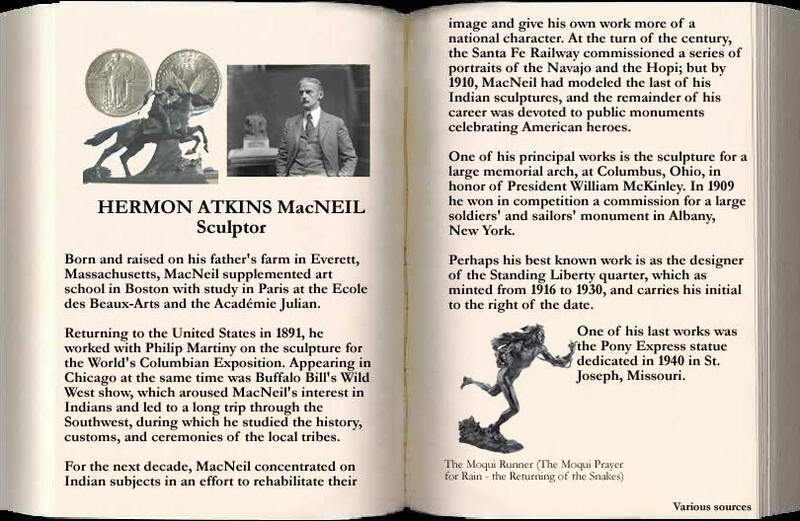 Her great-grandson, Jim Dixon found it an a box of memorabilia from the era when she bought her MacNeil sculpture. Eda Lord, (the woman who purchased the MacNeil bronze statue, “Primitive Indian Music” ~ 1894), attended the World’s Columbian Exposition on “Chicago Day.” Jim Dixon sent us a scan of his great-grandmother’s actual Ticket to the Chicago World’s Fair. Eda Lord was not alone. Chicago Day was packed. A total of 716,881 people attended for “Chicago Day,” October 9, 1893. 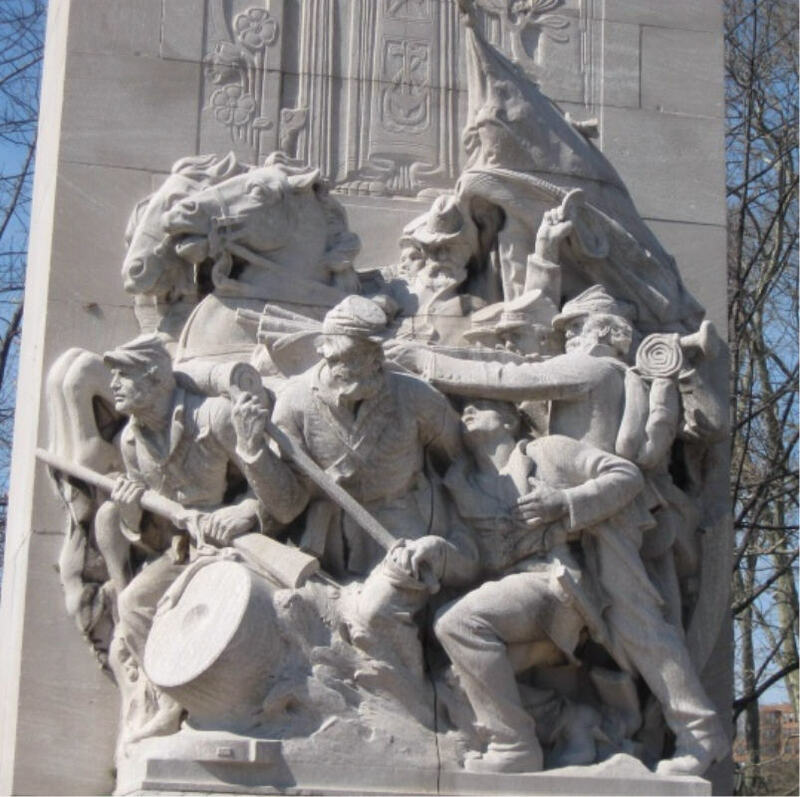 That day commemorated the anniversary of the Great Chicago Fire of 1871. The ‘Chicago Day’ marked Chicago’s rebirth. Every day of the Chicago World’s Fair marked the city’s arrival on the world-scene. 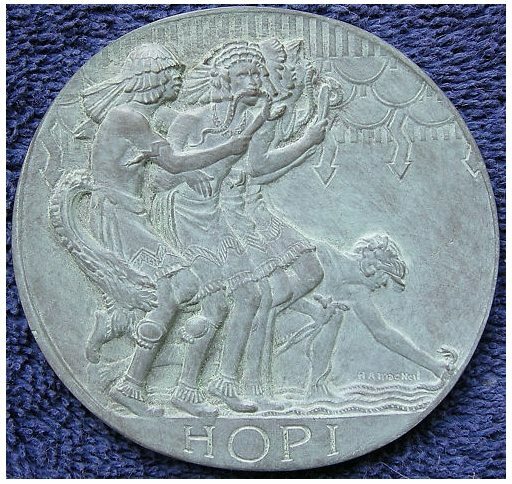 While New York City, Washington, D.C., and St.Louis, had all competed for this ‘Columbian’ 400-year-extravaganza, Chicago won the honors (and labors). The CWE invited America to come take notice that this western-railroad-cattletown was now a cultural-financial center. 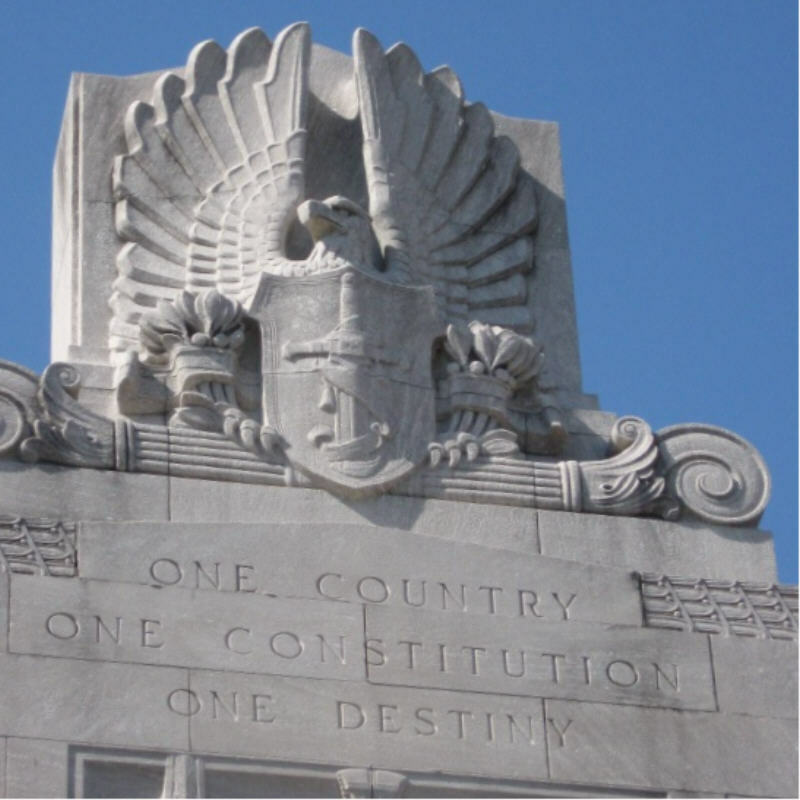 Like Columbus himself, the European “Old World” of art and architecture had crossed the Atlantic Ocean and resurrected in this “New World” of American progress, industry, and prosperity. Now along the shore of this inland Great Lake a “White City” fantasy had emerged. 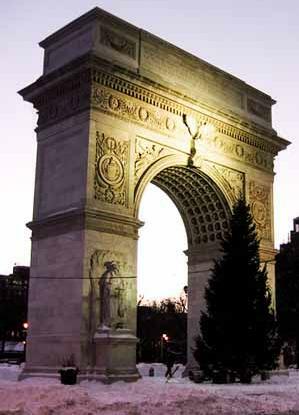 Crafted from the hands, talents, and imaginations of American “Beaux Arts” artists, sculptors and architects. And like Eda Lord, from all over the United States, Canada, South America, Europe, Asia and the world, they came. In total, over 27,000,000 million people attended the entire 1893 Columbia International Exposition. That number was half of the US population of 54 million then. How old was Eda Lord when she attended the Fair? Who would she go with? Would a lady attend alone? She lived in Evanston, north of the city. She could have rode the train from there in less than an hour into the “White City”. She might have passed the “Buffalo Bill Wild West Show” on her way to the main Gate. I started pouring through the boxes of family history tonight. I have a long way to go, but I found something that is perhaps a clue. Of all things, Eda Lord saved a ticket stub from the World’s Columbian Exposition for “Chicago Day” on Oct 9th 1893. The ticket is numbered and obviously a part was torn off. It is in perfect shape. Attached is a scan of the ticket. Much more exploring to do and I will send along anything relevant that I find. Well Jim, You have quite a find! That is a valuable souvenir. And a family history keepsake. Hermon MacNeil was there as well. For three years he worked on drawings, plans and sculpture. 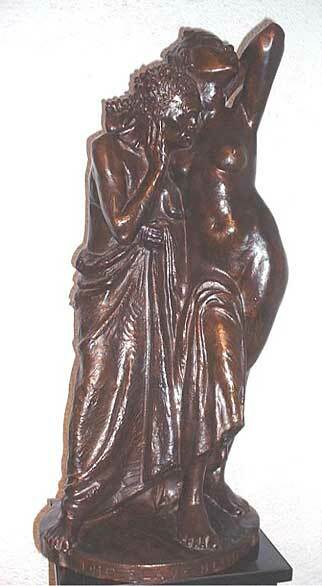 "Primitive Indian Music" Hermon A. MacNeil 1894, 24 inches, bronze. Purchased by Eda Lord about 1894-5. MacNeil sculpted figures on the Electricity building (MORE HERE). He was only 27 years old then. He had returned from study in Paris from about 1888 – 1890. He came to Chicago to work with Phillip Martiny. 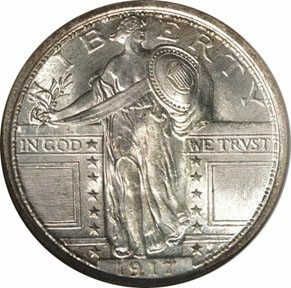 Some say he stopped in New York to get a letter of recommendation from August Saint-Gaudens to give to Martiny in Chicago. A hundred or more artists sculpted the White City. Many would be MacNeil’s contemporaries and colleagues through his life. 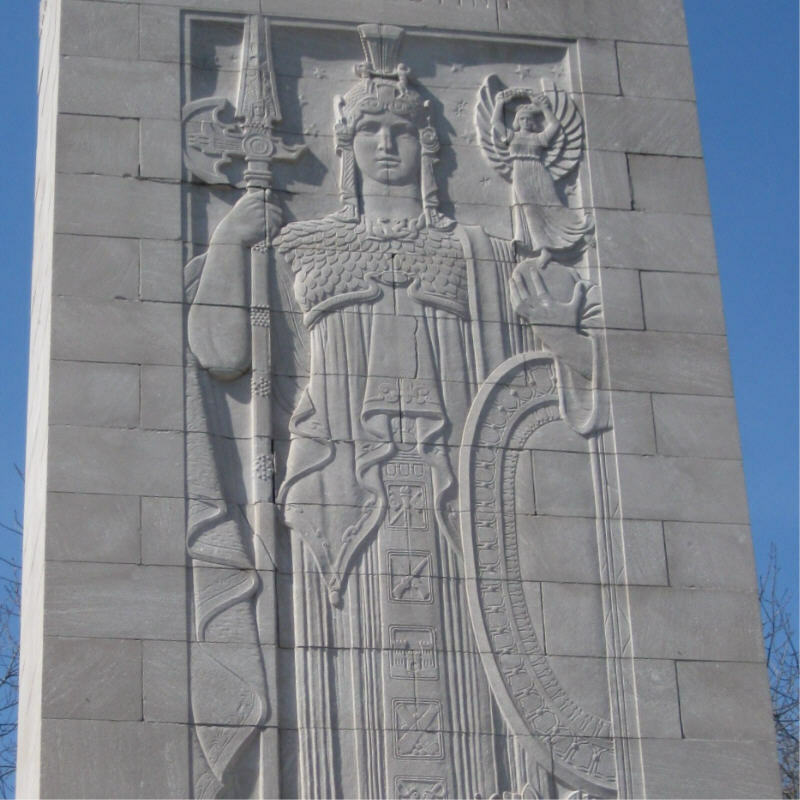 Carol Brooks, who Hermon MacNeil would marry two years later, was also one of the women sculptors called in at the last months to finish the plaster-staff statues that adorned the Fair. 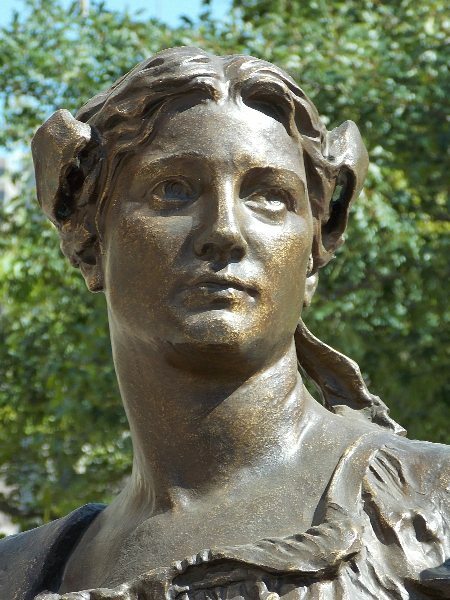 (Carol had studied sculpture with both Lorado Taft and Frederick William MacMonnies) Carol was also a member of “The White Rabbits” ~ a self-christened group of women sculptors called in to complete the massive work load of ‘staff’ statues needed for the Chicago Fair in 1893. ). Facial roughness of "Primitive Indian Music" bronze cast from 1894 suggests it is an early MacNeil attempt. His 1901 casts of "Primitive Chant" are more polished. Sculpting marks on thigh and hip of 1894 "Primitive Indian Music" bronze cast suggest it is an early MacNeil attempt. His 1901 casts of "Primitive Chant" are more polished. 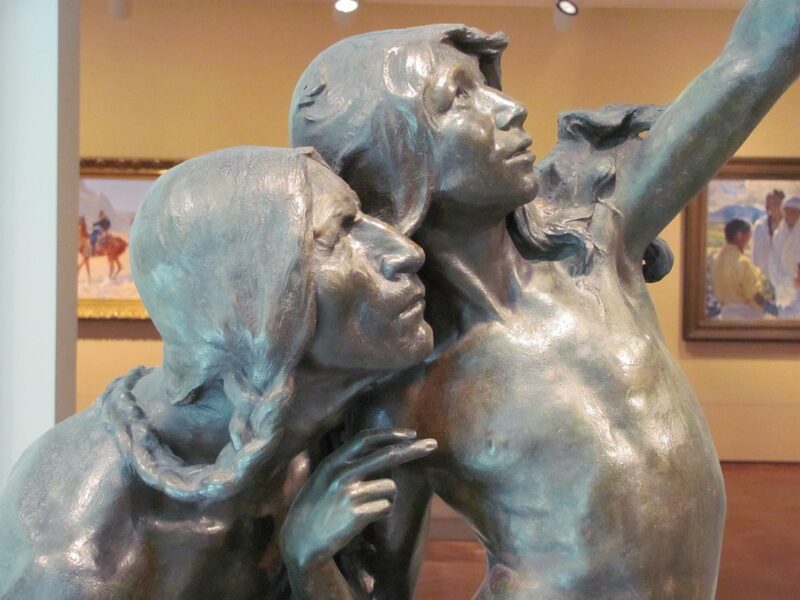 Part 2: “Primitive Indian Music” ~ 1894 bronze casting discovered! Is this an early prototype of 1901 “Primitive Chant to the Great Spirit.” ??? 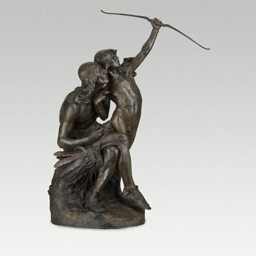 "Primitive Indian Music" - A rare 1894 bronze casting of a sculpture later refined and cast in multiple copies as the "Primitive Chant to the great Spirit." 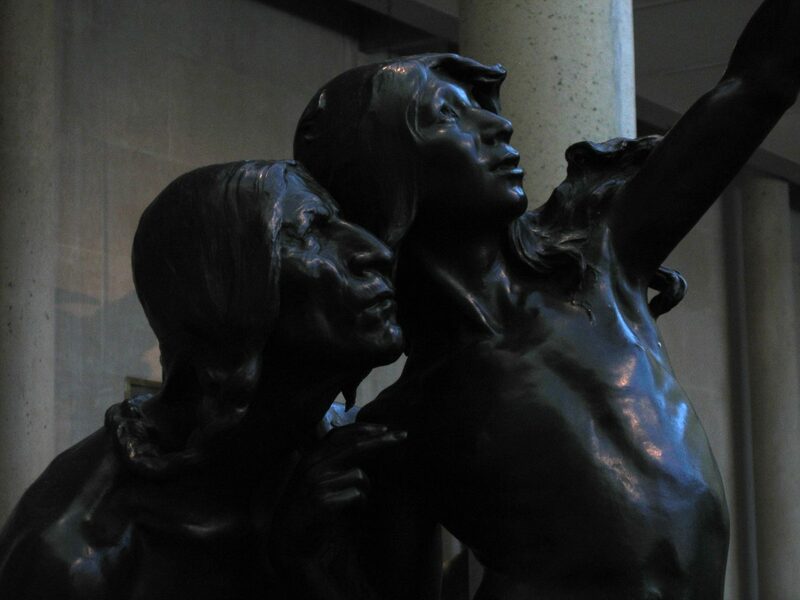 A recent inquiry from James Dixon has revealed a previously unseen 1894 bronze casting entitled “Primitive Indian Music.” The piece appears to be an early (or earliest) proto-type of “The Primitive Chant to the Great Spirit” by Hermon A. MacNeil dated 1901. This ‘Dixon’ piece is marked like no other bronzes of the “Primitive Chant.” All others are dated 1901. 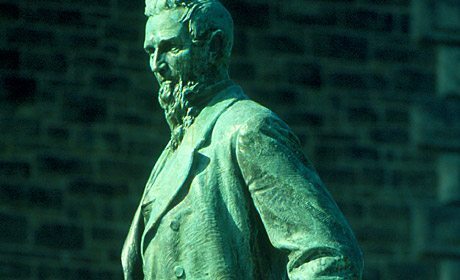 Jim tells us that his great grandmother, Eda Lord, lived in Evanston, Illinois, and purchased the statue between 1890 and 1900. 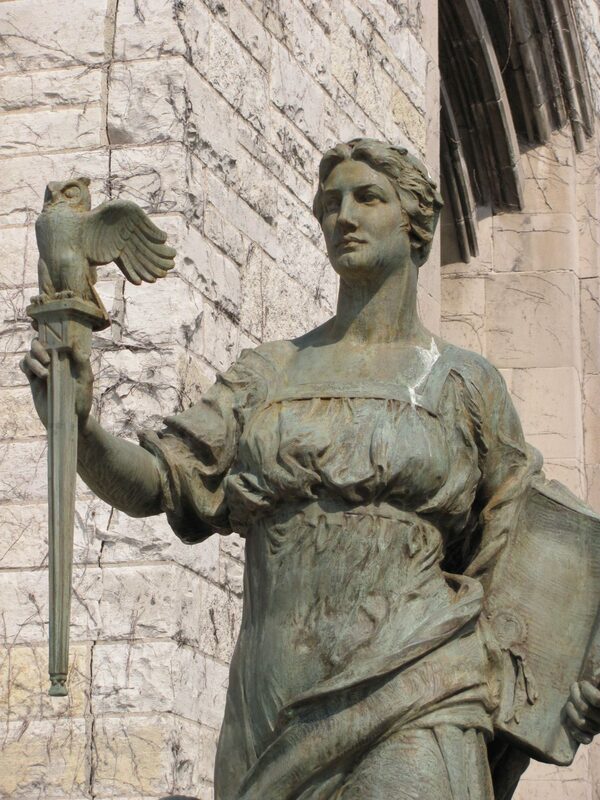 My Great Grandmother, Eda Lord, purchased a MacNeil sculpture in the late 1800’s when she lived in Evanston, Illinois. The sculpture made its way down the family tree to my Grandmother and then to my mom and dad and it was passed on to me when my mom passed away last year. 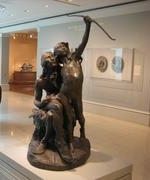 The statue is of an Indian boy and is about 24″ tall (bronze) It is labeled “Primitive Indian Music MacNeil s: ’94” My review of the works of MacNeil pointed to the sculpture entitled “A primitive chant to the Great Spirit” at the Smithsonian Museum. 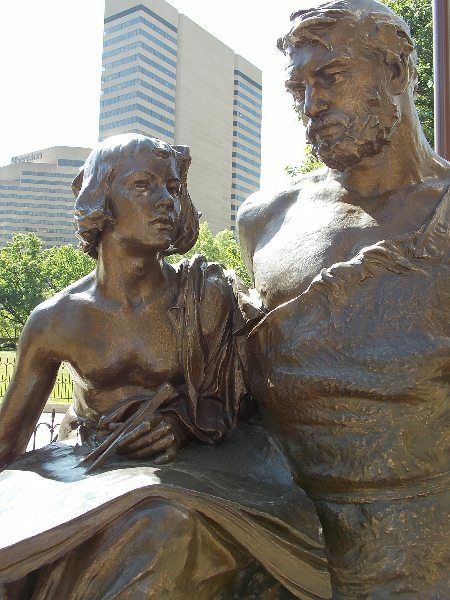 My observation of the photo of “A primitive Chant…” lead me to believe that the two sculptures are the same. It this possible? Were multiple casting made of these statues? 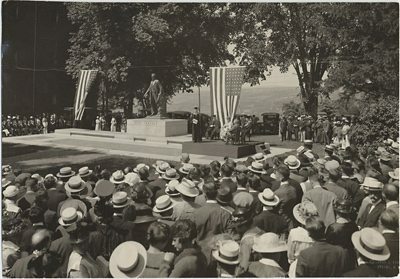 Was it common to re-cast the statue at a later time? I would be happy to send digital photos of the sculpture for your records, review and comments. 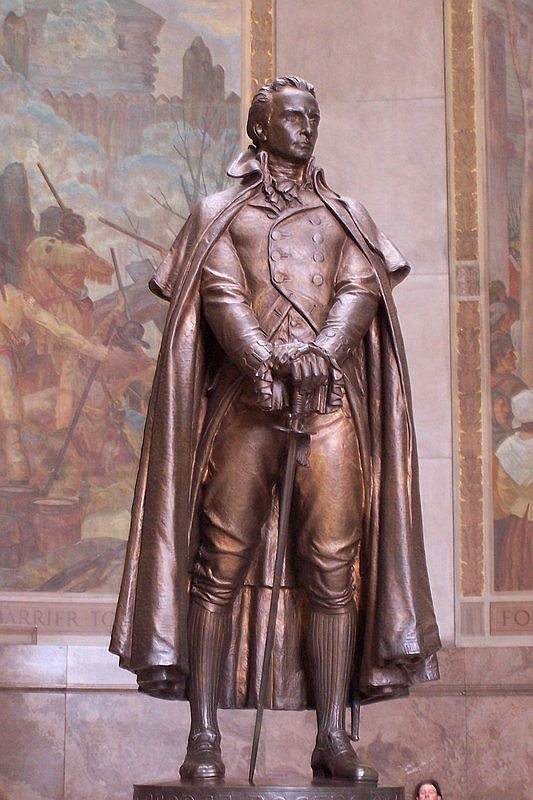 Any further information you may have on this statue would be appreciated. Hers is partial title "Indian Music" and "MACNEIL Sc" with date " '94"
No foundry marks appear on this Dixon Family heirloom. More importantly no RBW (Roman Bronze Works) initials or name appears on the casting. Roman Bronze Works is where most museum pieces of this work were cast. 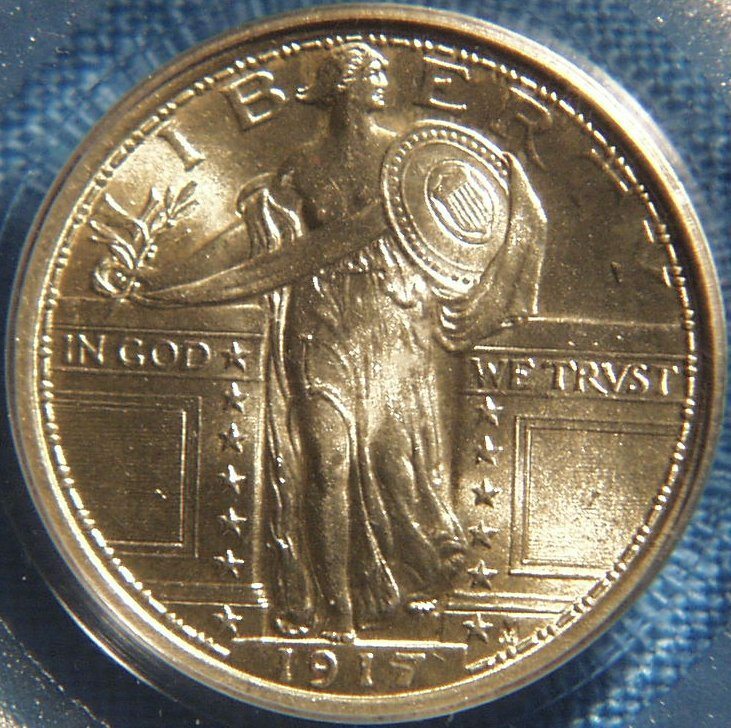 They also bear the date of 1901. RBW opened its doors in 1900 the same time that Hermon MacNeil settled in College Point, Queens, NYC, New York. The absence of RBW’s distinguishing mark, as found on the 1901 casts, and the Dixon family story of acquisition would seem to indicate a date before 1900 for the casting of this piece. It was a life-size bronze, which he indicated, not done in full relief but resting on a plaque a strong piece of portraiture. 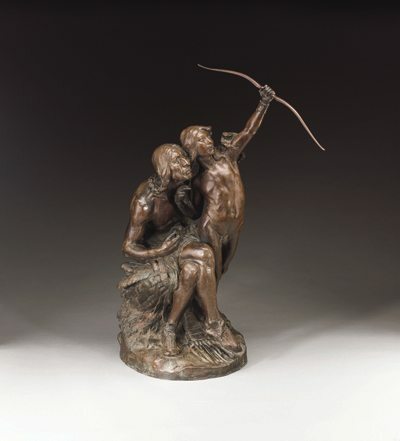 The only other evidence of a MacNeil Bronze from this period (1894) is “the Vow to Vengeance” in the Art Institute of Chicago which lists a date marking on 1894 as well. SEE AIC Website HERE. Many old photos of ‘plaster casts’ of this sculpture appear in museum archives. This ‘Dixon’ bronze appears to be a very different find than other models, either plaster or bronze. Thanks Jim for the photos and inquiry. 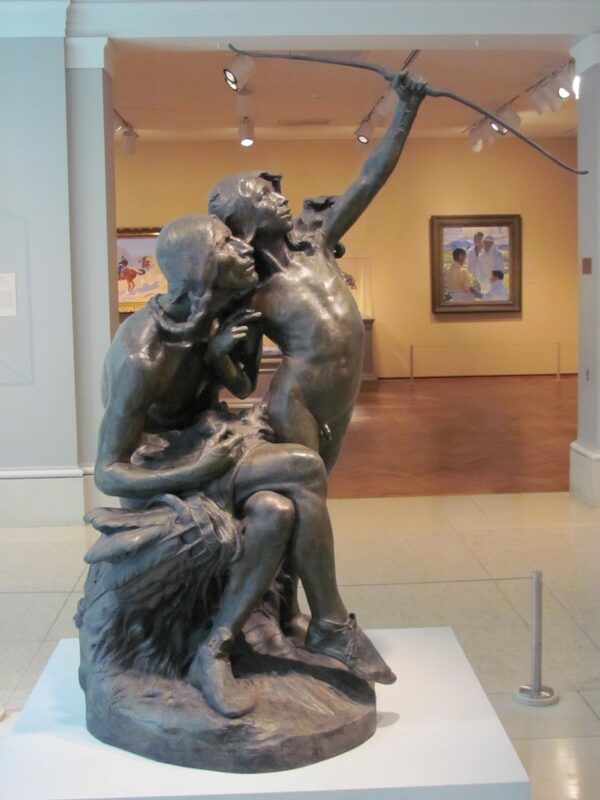 This seems a VERY early bronze casting from MacNeil’s 1893-1895 days at the Art Institute of Chicago (1893-1895). This “Primitive Indian Music” seems an early version of his “Primitive Chant to the Great Spirit.” of 1901. Your piece seems to be a ‘first’ to me. Spelled RARE. There maybe others, but they are not in museum archives, or accessible on-line. I certainly have not seen them. 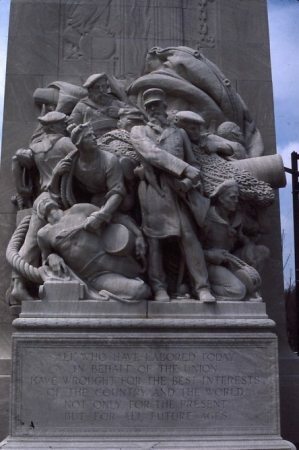 All other bronze casts I have seen photos of date after 1900. This includes “Primitive Chant” from museums and auction house photos. All those have RBW initials from NYC -Roman Bronze Works. The work seems much less finished (polished). It appears rougher in texture (more primitive? early?). Not only Primitive Indian…, but also maybe Primitive MacNeil… ? CONCLUSION (for now): This is a fascinating piece that seems to this non-curator-MacNeil-enthusiast to be one of Hermon’s earliest concepts of what he later cast as “Primitive Chant to the Great Spirit” in 1901. 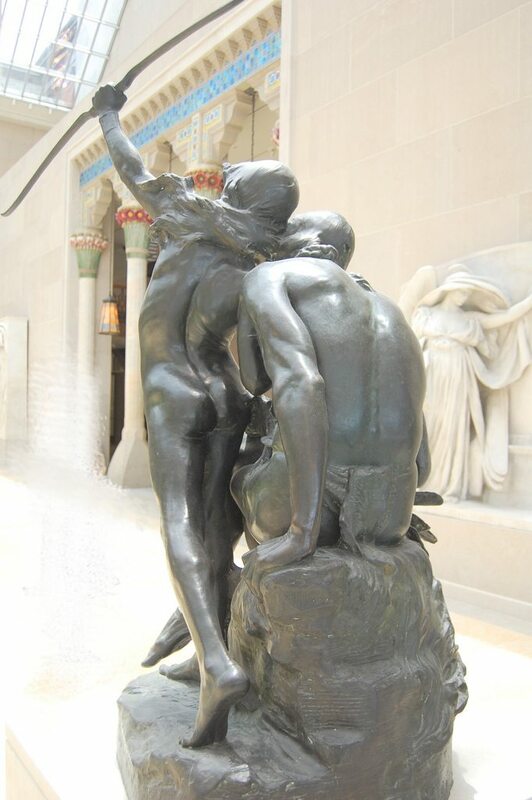 That piece was cast by Roman Bronze Works when MacNeil settled there in his studio-home in College Point NYC. NEXT: “Who was Eda Lord? 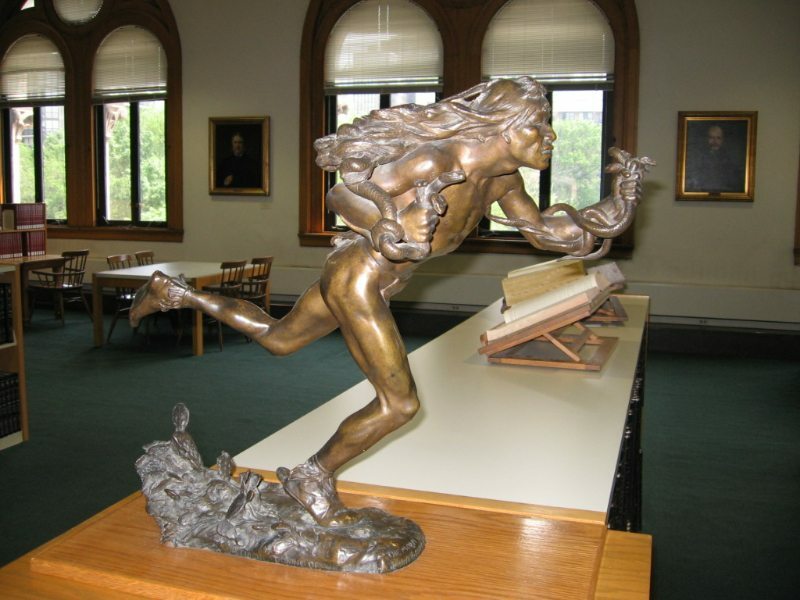 And How did she become owner of this early MacNeil sculpture? 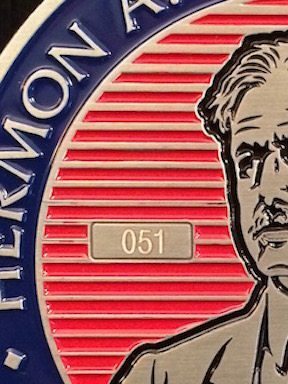 Hermon MacNeil’s interest in Native American culture began in (of all places) Chicago. Before he ever traveled to the Southwest in 1895 to visit the Hopi (Moqui), and Navajo people, Native culture visited him in Chicago. The live Native model for “The Primitive Chant” (at left) was a Sioux warrior by the name of Black Pipe. Hermon first saw Black Pipe in the ‘Buffalo Bill’s Wild West Show’ at the Chicago World’s Fair of 1893. That winter, MacNeil found Black Pipe cold and desolate on the sidewalks of Chicago. 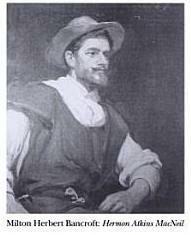 MacNeil said that he gave him food and work as a model and an assistant in MacNeil’s studio (shared with Charles F. Browne). The urging and support of Edward Everett Ayers led MacNeil and two companions, Hamlin Garland and Charles F. Browne, to travel to the southwestern territories (four-corners of New Mexico, Colorado, Arizona, Utah) in the summer of 1895. Their goals were to witness the vanishing images of the Native people, of the Southwest. “Four years of them with three hundred and sixty-five days in each year! To live in the Villa dell’ Aurora, to work upon subjects of one’s own choice, with no care and all expenses paid — what better could an artist ask for.? 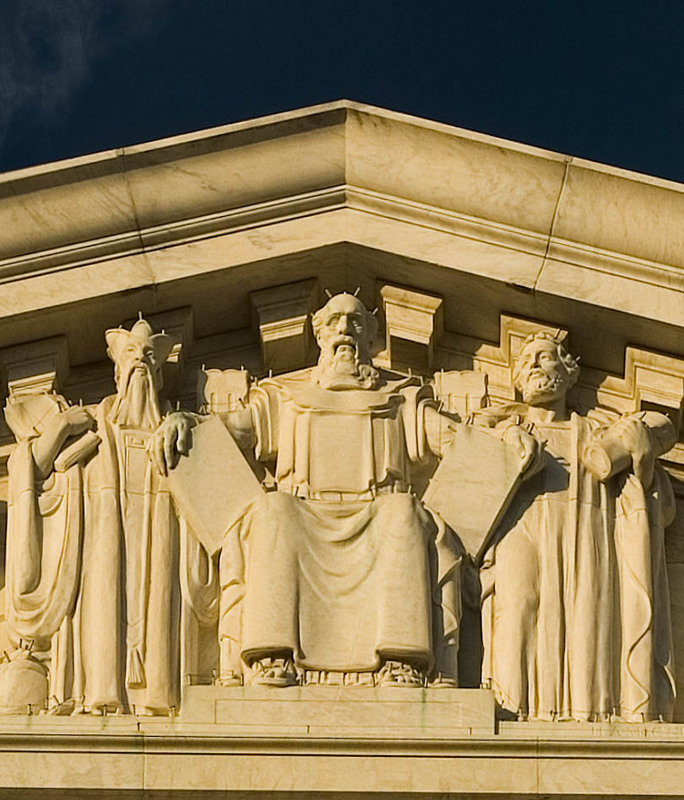 The only requirements made by the trustees were “satisfying evidences of industry,” to be attested in the form of “a life-size figure at the end of the second year, a relief containing two life-size figures before the close of the third year, and during the fourth year a life-size group of two or more figures in the round.” [Lorado Taft, The History of American Sculpture, 1903, p. 439]. 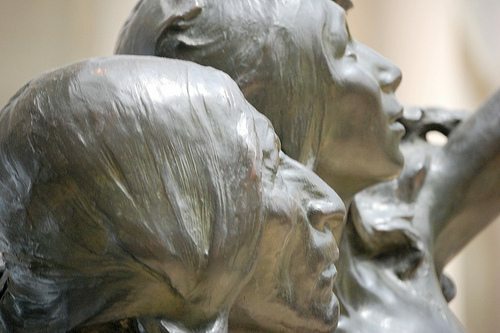 “The next figure, ” A Primitive Chant,” possesses every technical quality of good sculpture. While the idea of an Indian making strange noises by blowing or shouting in the crook of his arm awakens no responsive thrill of imagination, this is nevertheless a powerful work. Its triumph is all the more marked since our surrender is, in a sense, an unwilling one. We are not prejudiced in favor of this tuneful creature, who, unlike a Hector or an Achilles, brings to his aid no emotional backing of poetry, no prestige of three thousand years’ success upon the ” boards.” This is sculpture pure and simple, — beauty of form, strength with refinement of modelling, compactness, breadth. The figure kneels, taking hold of the earth with powerful limbs ; the hands are clasped, the right elbow tight across the body, the arm raised at a right angle, concealing largely the savage face. The expanded chest and powerful back have fascinated the sculptor ; he has shaped them superbly. 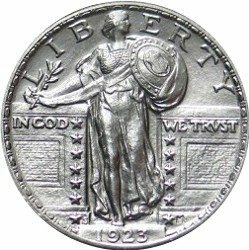 Larado Taft's words describe this kneeling pose of "The Primitive Chant." 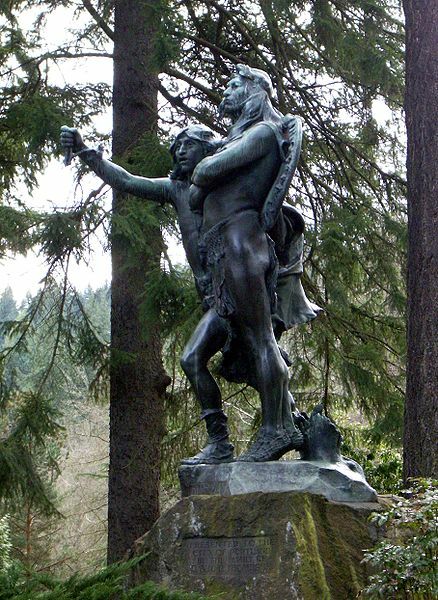 The 'upright-dancing-warrior' is a more commonly seen version of MacNeil's work. 24 1/2 x 6 1/8 x 8 3/4 in. 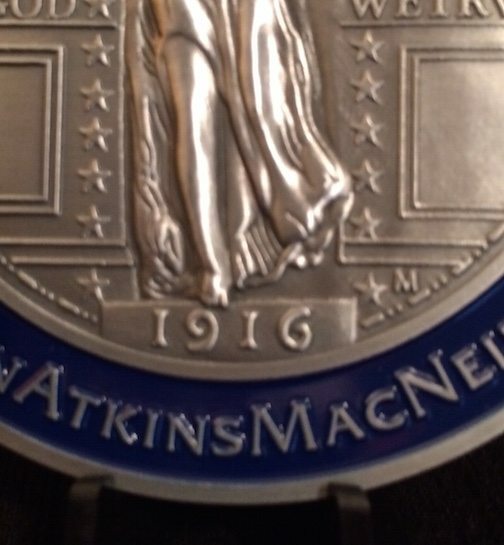 MacNeil has interpreted an Indian dancer as he chants into the crook of his upraised arm. 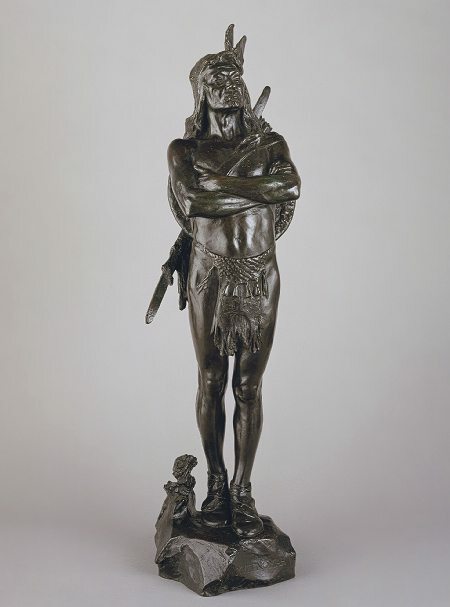 The model for this sculpture was a Sioux Indian named Black Pipe, who was part of Buffalo Bill’s Wild West Show at the 1893 World’s Columbian Exposition in Chicago. Black Pipe remained in Chicago after the fair closed and became a regular model and studio assistant for MacNeil. The artist maintained a studio in Chicago, but traveled many times to the Southwest to observe Indian rituals, costumes, crafts, and ceremonies firsthand. In Primitive Chant, MacNeil captures the physical beauty and grace of the Native American, which he compared to that of Greek warriors.